Chance plays as big a role in my reading decisions as anything else. I recently went to the library with the explicit intention to check out The Unknowns by Gabriel Roth. And, while sifting through the "FIC-ROT" section, I of course came across a trove of Philip Roth books. I like Roth, and had read good things about Nemesis, so I snaffled that book as well in my most recent visit. I can hardly claim to be a Roth expert, having only read perhaps a half-dozen entries from his voluminous output, but I have read enough to be really impressed at the variety of his writing. Which I suppose shouldn't be surprising... it would probably be more shocking if a non-genre writer managed to keep doing the same thing for more than fifty years without changing his or her style. Still, I'm regularly impressed at just how assuredly and confidently he can write any of these stories, making it feel as though he's been practicing that particular style for decades. Nemesis is one of his latest books, but if I didn't know that, I might think it was one of his first. The story structure is more straightforward than in books like The Counterlife, and the writing is fairly direct, with less of the intricacy I remember from entries like American Pastoral. Of course, simpler doesn't mean worse, and while there are only a few themes in this book they are very powerfully explored. I'm left with a few very strong, gripping images, rather than the sometimes-bewildering array of memories after reading Roth's more complex stories. In some ways, this book reminds me a little of The Plot Against America: the circa-WWII setting, with a focus on New Jersey, along with a highly readable and gripping prose style. Nemesis is much less fantastic, though, and deals with an actual historical moment rather than the counter-factual history of TPAA. Nemesis also feels like a more human story: it's very focused on a small collection of characters, particularly the protagonist, while TPAA had more fun spinning out the plot, and tended to use characters as a means towards that end. Nemesis focuses on Bucky Cantor, who I think is one of the most likeable characters who I've recently encountered. Like many of Roth's characters, Bucky is Jewish, living in the Jewish neighborhood of Weequahic in Newark. It's the summer of 1944, at the height of American involvement in WWII. All of Bucky's friends have gone to war; he tried to enlist, but was rejected as a 4F due to his poor eyesight and short stature. Despite that, though, Bucky is a powerful and vigorous young man, who has been physically training and excelling at sports for practically his entire life. He's a hero to the young Jewish kids of the neighborhood, where he supervises the playground in the summer. He's about the most perfect role model you could imagine: he's patient with the unskilled kids, encourages their progress, sets good examples of sportsmanship, and protects them against threats both on and off the field. It's a huge testament to Roth's writing prowess that this might be the first time in my life that I've been able to think about organized sports as a positive thing. My attitude towards gym class while growing up varied between hatred and resentment; it seemed frustrating, pointless, and demoralizing. (It wasn't until I became an adult that I realized that I actually enjoy physical activity, just not the competitive nature of organized sports.) Bucky, though, is a very eloquent champion of the virtues of sports and physical fitness, and ties it to these young boys' self-esteem and role as citizens. Many people in this neighborhood were just one generation removed from the ghettos of Europe, and excelling in sports isn't just a means to assimilation, but also a way to give oneself the confidence to protect oneself against anti-semitism. Bucky isn't the most bookish guy, but he's also hardly a dumb jock: he was the first member of his family to graduate from college, thanks in part to the amazing emotional support of his grandmother and grandfather, and he takes his mission as a caregiver to children very seriously. He still feels a lot of guilt over "missing" the war in Europe, but that just increases his already-substantial sense of purpose and responsibility to his community. Bucky was already admired, but becomes a minor hero when a polio epidemic strikes. I have to admit that, from my sheltered perspective in 21st-century America, I had only a vague notion of exactly what polio is. All I knew was that FDR got it, and it made his legs weak, and it was somehow connected to the iron lung. I succeeded in the difficult task of preventing myself from jumping on Wikipedia to research it, partly because I liked the idea of keeping myself in a mindset similar to that of the characters in this book. Polio is a mysterious disease, and while nobody in the novel is exactly sure what causes it or how it is spread, its effects are horrifying. It seems to particularly target young children and infants, much like a predator, killing many of them outright and leaving the survivors mangled, with twisted limbs. Early on, Bucky's virile protection of the playground seems to provide some sort of protection over Weequahic as a whole. While most of Newark has been infected, this community remains safe. That begins to change, though, and Bucky feels partly responsible when children from his playground are the first to be infested and die. Of course, people are worried by this, and the increasingly fraught nerves as the toll climbs higher threaten to transform into a panic. I was a little reminded of the antisemitic pogrom in The Plot Against America, but rather than false accusations being levied against a particular target, here there's a very particular harm but no certainty about the culprit. The reasonable pillars of the community seek to comfort people and keep them calm, but even they have to admit that they aren't sure what specifically can be done to halt the disease's spread. They offer their best possible advice: wash your hands, keep your home clean, avoid contact with the sick, try to get fresh air, and so on. But, of course, many of those who die seemed to have followed all of this advice, while others who flout it remain unscathed. In light of all this, it's natural that people in general (and Bucky in particular) begin to think dark thoughts about the fairness of life and the universe. This is rather cliche territory, but Roth explores it with fresh urgency: how can one believe in a loving and all-powerful God who allows innocent children to be killed? Why should we give God credit for prayers that are answered, and not ascribe blame for those that are ignored? It might be worth pointing out here that, as usual, Roth makes good use of the separation between author, narrator, and protagonist. I was reminded a little of American Pastoral's structure: in that book, it was easy to think that we were reading a third-person attached narrator of a story about The Swede. However, what we were actually reading was Nathan Zuckerman's embellishment of a story he'd heard about The Swede; Zuckerman only appears briefly on page near the start of that novel, but every word we read was written by him (as written by Roth). Similarly, Nemesis seems to be entirely about Bucky, but the actual narrator is one of the kids from the playground. It's a little surprising to hear him chime up at one point in the book - basically just saying, "Oh, yeah, that kid who got polio was me" - and then he appears for a bit longer near the end, describing how he was reunited with Bucky decades later and learned his story. All that to say, while the novel tackles some heavy stuff, it doesn't really feel like a polemic. We get Bucky's perspective of a cruel and malicious God, which is viewed with skepticism by the atheistic narrator, all of which is being presented to us by Roth. The mediation isn't nearly as important here as it is in some of Roth's other books, but it's still interesting and effective. Nemesis feels unusually propulsive, and late in the book, one bombshell drops after another. Bucky surprises us and himself when he agrees to abandon his playground duties and retreat to the safer environments of a remote summer camp. That was very narratively surprising, since it seemed to violate the heroic structure of the story so far. The book reaches a dark climax when polio cases begin to appear in the camp as well, and reaches its apex/nadir when Bucky himself is diagnosed with polio, confirming his horrible suspicions that, rather than being the guardian of the children, he was in fact their destroyer. The actual truth of this belief is left open to questioning, as the narrator does at some length. For whatever it might be worth, I'm inclined to agree with him. I could believe that Bucky could be an asymptomatic carrier, who ignorantly infected his charges. However, given that he actually starts showing symptoms several days after the counselor does, I don't think it's possible that he could have first started carrying it way back before all the kids were infected. The timelines just don't seem to add up. (And, now that I've finished the book and finally rushed to read all about polio on Wikipedia, I feel vindicated in that decision). That said, though, even if I don't believe that Bucky was responsible, I certainly can believe that he felt responsible. For so much of the book he felt like he was abandoning his moral obligations - to serve in the war effort, to stand by his post at the playground - even though reasonable people would certainly say that he was hopeless to prevent the first case and making a perfectly defensible choice in the second case. That sense of guilt easily transmutes into a sense of failure, and a mind like Bucky's will seize on something tangible to anchor that failure to. This book ended up being far more depressing than I had initially thought. Rather than the tale of a solid, reliable young man who stood up for what he believed in and helped people survive the emotional trauma of a horrific plague, it became a tragedy, the tale of a man deserting his post and losing all happiness from his life. For all the sadness, though, it's still a beautifully written story, if not one I see myself running back to any time soon. Nemesis might be the most accessible Roth I've read yet, alongside The Plot Against America. It's simple but powerful, not unlike its protagonist. As with many Roth tales, it's rooted in a very specific time, place, and community, but that same specificity allows it to address some universal ideas in a very engaging way. While I can't say this is the most enjoyable Roth story I've read, it's very well-crafted and another fine example of his vast range. I've decided to modify my usual practice of posting insanely long albums consisting of screenshots from RPGs, and instead post an album that only covers the first chapter of NWN2, and is merely gargantuan in length. This time I captioned the album before writing the post, so I've already touched on some character and plot details in there (mild spoiler warning!) and don't feel like repeating myself in this post. So, congratulations, you get a shorter post than usual! A quick tangent on the topic of web albums: loyal readers might have noticed that I've enabled Google's face-detection algorithms, and am inordinately amused when it manages to place circles around the faces of characters in my fantasy and science-fiction role-playing games. It's been able to instantly recognize all humanoid characters from the Dragon Age and Mass Effect franchises, even among races that we don't recognize as humans, such as Asari and elves. (Impressively, it's even able to group them accurately; it knows the difference between Liara and Samara, and between Shianni and Ariane.) It wasn't able to identify any faces in NWN1, which isn't surprising, given how limited its graphics were. (Exception: in extreme close-up, it could identify a couple of major NPCs like the Valsharess.) In NWN2, though, it can recognize practically everyone, often even if they are in profile or partially obscured. That's pretty impressive, and also kind of crazy. I think it's amazing that, like, there's a particular threshold of polygons above which we can fool a computer into thinking that a video-game character is a real human being. And, in more disappointing news, the only humanoid character in NWN2 that Google doesn't recognize as a person is my PC... who happens to have black skin. Dang. Hopefully that's because of his hat. It's a sweet hat! You have much more flexibility to mix-and-match gear in NWN games compared to the DA series, and in some ways I prefer the fashions of this game. Take helmets as a specific example. In DA, helmets are a major source of stats, and are often parts of matching sets that must all be equipped in order to gain large bonuses. So, you're often stuck wearing a shockingly ugly mage cap, or a full plate helmet that fully obscures your character's beautiful face. In contrast, in the D&D system helmets have very low bonuses, so the stats don't matter very much and you can pick based on appearance without penalizing your character. Also, NWN has cloaks! Man, I miss cloaks. They look so awesome. So, armor is one way in which, despite being less technically advanced than DA, NWN graphics can actually feel richer than DA. Another major aspect is lighting. DA uses fixed lighting for all scenes: it's always just after twilight in camp, always midday in Denerim, etc. And it looks good. NWN2, though, has a full day-night cycle, like the Ultima or Elder Scrolls franchises. It's purely cosmetic - shops never close, NPCs don't travel on schedules - but man, it looks so good! Because cut-scenes, conversations, and combat can occur at any time, you can get totally different looks for your scenes than another player would, just based on the time when it occurs. I've written about this at length before, but modern BioWare's approach to RPGs depends on carefully staged scenes. They're a bit like Hollywood movies, with excellent blocking, camera work, scenery, reaction shots, etc. They look great, but, to me, slightly diminish the value of replays, since the cut-scenes will seem a bit same-y after a while. In contrast, earlier BioWare games (like Baldur's Gate) and many other RPG franchises use more emergent systems for scenes: they might occur after a timer has expired, or when certain conditions are met, regardless of where the player is and what their surroundings are. NWN2 is more in this vein, and as a result the companion chats, while technically lower-fidelity than those in DA, feel more unique to your experience. Every time you talk with Morrigan about Flemeth's mirror, it will be the same time of day, she'll always have her back to her small fire, she'll make the same gestures, etc. 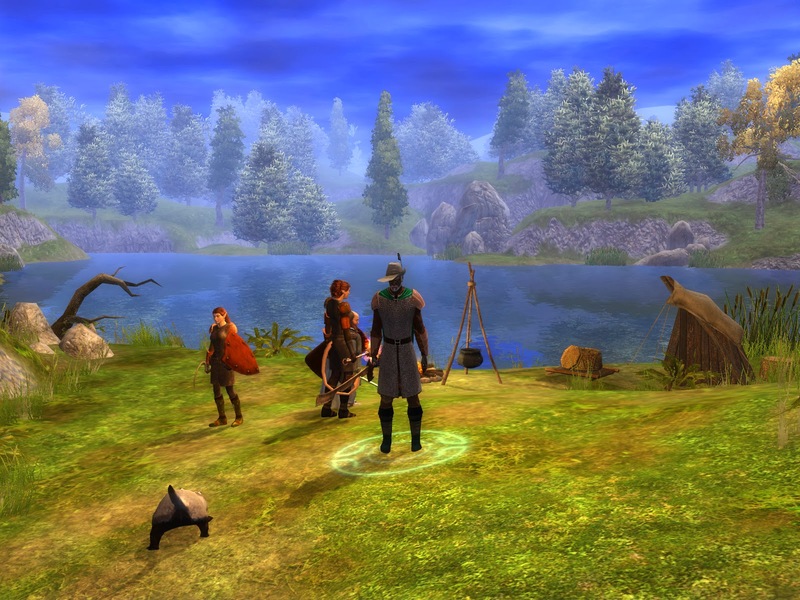 In contrast, when you chat with Elanee about her prior lives, you could be standing in a midday swamp next to Khelgar, or lurking in a Neverwinter alley with Neeshka, or relaxing in a candlelit inn surrounded by friends. Now, this does mean a less controlled atmosphere, and so you'll occasionally get weird blocking; but for the most part it looks surprisingly good, and I think would help subsequent play-throughs feel fresher. Moving on from graphics: I've been really pleased by how well-drawn the companion characters are. I've already written about the progression in quality from NWN1 to HotU, from disengaged automatons practically devoid of personality to unique and engaging characters. Well, NWN2 feels like another leap up from the already-good characters in HotU. I think this is partly a result of the increased party size: so far I've been able to recruit eight NPCs, and I think there might be a couple more to come; similar to DA, they hang out in a home base when you're not actively traveling with them, so you can stay somewhat involved in their stories without totally committing to a set party; and best of all, you can finally have four party members (your PC plus three NPCs, plus whatever summons or familiars they have). Among other things, this leads to some really great banters, and great-if-frustrating intra-party conflicts. The Baldur's Gate series had a bunch of these, done incredibly well, which forced you to think carefully about members' alignments in addition to their battle prowess; HotU finally re-introduced banters, but they were all flavor, and came from a fairly small number of potential members; in contrast, NWN2 finally brings back the true D&D party feel of the earlier BG series. I don't think it's necessarily any better than DA, but it has a different feel; the conflicts feel a bit more serious and potentially dangerous, unlike in DA where it was pretty easy to navigate conversational minefields to keep everyone happy. Combat and AI are much improved from NWN1. Very improved, in fact. I absolutely hated the AI in those early games, and it was particularly bad at some things like spellcasting. In NWN2, I almost never need to jump in and manually control my party members: they're great about picking the right spells and feats to use at the right times. My spellcaster opens up with high-damage AOE attacks at the start of combat, buffs the most appropriate characters, and heals people when they're low on health; my tank uses knockdowns and taunts to keep attention on himself; my thief sneaks up on enemies who are engaged with one of the two tanks, then launches sneak attacks on them to burn them down. And I'm not even setting any tactics or anything. It all just seems to work, and is pretty magical. I'm very impressed. One of the few faults with the AI: pathfinding is pretty bad. It's inconsistently bad, and I haven't been able to figure out what triggers it, but sometimes an character will get stuck at a corner and not be able to move forwards. Other times they'll head in the opposite direction of the fight; this is usually just annoying, but I've also had some disastrous results when they've opened a door and started an entirely new second fight while my PC is trying to hold down an entire flank all by himself. It doesn't happen often enough for me to think about it in advance, but often enough for me to feel annoyed. Hm.... I don't want to go into plot in this post. There's a bit in the aforementioned web album, and I'll probably write up more after I've finished the game and gotten the complete picture. I would like to write a bit about my character, though, so I will! I love RPGs, and usually try to avoid repeating myself. I enjoy switching up races, classes, personalities, and even genders from one game to another. In my multiple decades of playing RPGs, though, I don't think that I've ever picked a fighter class in a game that offers a choice of characters, even on replays. As far back as Hero Quest / Quest for Glory, I've tended to be attracted towards thieves, with mages as an attractive fallback. Well, there's a first time for everything, so I decided to roll Toman Benton as a fighter. It's been pretty fun! A big part of the reason why I've tended to avoid fighters is because they seem boring. Rogues usually have a large toolkit of solutions to a problem: they can attack, or sneak their way around it, or talk their way out of trouble, or pick the lock of an alternate route, etc. Wizards usually have complex spell systems to manage, and I can put a lot of thought into deciding which spells to study, how to structure spells to create effective combos, etc. Fighters... hit things with big sticks until they die. Not as interesting. But, at least in NWN2, not boring, either. First of all, with 3rd edition D&D rules, it's really easy to drop in other class levels to create a more complex character. In my case, I took a single level of Bard, which makes me a slightly more effective leader and lets me inspire my companions to fight more valiantly; building on my bard skills, I then started taking levels in Red Dragon Disciple. In many ways this supports my fighter build, by giving me lots of hit points, better physical stats, some useful combat immunities, etc. However, it also grants access to some unique (but complementary) abilities, such as the ability to breathe fire on my enemies. Eventually, I plan on taking some Weapon Master levels, which will let me achieve complete mastery of my two-handed falchion fighting style. Even as a straight fighter, though, there's some fun stuff to do. I get to tank for my companions, charging into combat and drawing enemy fire, keeping them distracted while Neeshka sneaks in to stab them. I feel like I'm responsible for overall strategy for any given encounter, deciding when to press forwards and when to fall back and regroup. I have far fewer tools at my disposal than a rogue or a mage, but combats aren't rote, so I'm enjoying it so far. Playing around with personality has been fun, too. I tend to have a couple of archetypes who I enjoy playing as in my RPGs. I often make my thieves into mischievous tricksters, happy to rob people blind and shameless liars, but who deep-down care about the greater good and will use underhanded means to achieve positive ends. Other PCs are more classical do-gooder types, often with particular empathy for certain oppressed groups, who quietly organize like-minded people in pursuit of their goals. The former maps onto Chaotic Good, the latter is vaguely Neutral Good. Toman is technically Chaotic Good, but expressed in a very different way than that of Seberin the dwarf commoner rogue or Cirion the half-elf bard. Toman is blunt and outspoken where the others were circumspect and duplicitous; he enjoys tweaking other people, doesn't bow to social niceties, and can sometimes exasperate his allies, but ultimately wins them around thanks to his unflinching war against evil. I don't really have a direct inspiration for him, but it mixes aspects of Boromir, Malcolm Reynolds, and Brynden Tully. That's a good place to leave this for now, I guess. I think I'm about 1/3 of the way through the game, and will probably do one more post at the end. It may be a while; I recently got the itch to jump back into Fall from Heaven 2 again, and have been lent The Last of Us, so I might put this one on the shelf for a little while. Not too long, though! I'm loving the atmosphere and characters, and finding the plot pretty interesting, so I'm looking forward to seeing how it all develops. And, yet, moving one step closer to Mask of the Betrayer. I always read the fiction reviews in each issue of The New Yorker. Maybe once a year, a particular "Briefly Noted" review will hit enough keywords to make me think, "Oooh, that sounds like something I would like." So far I've had a 100% success rate in following up those leads. The latest discovery is "The Unknowns" by Gabriel Roth. This is a really uncanny book; early on it felt like it was being written about me, in particular, and really honed in to a frightening degree on several qualities about myself that I think of as fairly unique and that I rarely see portrayed in literature: a passion for writing text adventure games as a child that eventually evolved into a career as a software developer; a deep love of programming not only for what it can accomplish, but for the sense of emotional fullness it can create; a nervous and occasionally fraught social life, clumsily mitigated by attempts to apply systems and frameworks onto fluid emotional dynamics; relocating from the often less-ambitious middle of the country to the enthusiastic utopia of San Francisco. The main character is also the narrator, so there's a strong level of intimacy in the way he describes childhood obsessions and humiliations. Eric is a very flawed character, and someone who is very aware of his flaws. He doesn't really apologize for them, instead presenting them (to the reader) with pure honesty and openness, often to a discomforting degree. That's where the other part of the uncanniness started to come into play for me: after identifying so strongly with him in so many ways, I had to remind myself that I was not him and don't necessarily share in all of his shortcomings. I'd like to think that I'm a bit more empathetic, less manipulative, and more kind. Of course, that would be a far less interesting character, so I'm glad that the author made the choices he did. This isn't exactly a plot-heavy book, but for safety's sake I'll discuss the plot down here anyways. The setting of the book is really interesting: it just recently came out, but is set in 2002, two market crashes ago. Events in the book are backgrounded by the run-up to the Iraq war and the prolonged deflation after the millennial tech bubble burst. The protagonist has very little genuine reaction to either the 9/11 terrorist attacks or the rush to war. However, he is an astute observer of others, both as individuals and as a whole, and so he knows the things he must say about each in order to remain included in the liberal San Franciscan social scene. He isn't pretending to be a liberal when he's actually a conservative: he's pretending he cares about it at all when really he doesn't. He has a closer connection to the tech bubble, but even this is through a thick film of disinterest. He lucked out greatly on timing: after unwillingly skipping college, he moved to SF to found a small startup, which managed to sell itself just as the markets were starting to collapse. By the standards of Silicon Valley, he is a pure success: a multimillionaire ($18.4 million dollars, and you'd better believe that anyone in that position remembers the precise figure) at age 24, with a reputation of a success that will open any doors that he wants for the rest of his life. And... he doesn't know what he wants. He bought a nice apartment, and stays inside for days at a time. He has a small social circle, centered around people he knew from home who also moved to SF, and makes ritual appearances at parties and other social obligations. Once he finds someone he likes, though, he turns the entire force of his intelligence and latent energies into calculating how he can start a relationship with them. That relationship, in all its stages, is the real heart of this book. I was alternately impressed and horrified by his tactics and reactions while pursuing love; I can't think of another book that has presented this in quite the same way. Structurally, the book alternates between chapters set in 2002, depicting the travails of a gifted but broken young man stuck inside his own head; and chapters set in his childhood, showing how he got to be this way. As noted above, I was a bit nonplussed by how on-the-mark some of the childhood scenes were, down to details like fantasizing about how other people will be amazed by this text adventure you're writing, or feeling deep shame after ignoring a "nerdy" friend in hopes of pursuing some higher social station. But, on balance, I had a much better time of things than Eric: his parents divorced, he didn't have the refuge of a church or other alternative community apart from school, and he suffered the kind of humiliation I would only have nightmares about. In general, I strongly preferred the modern chapters to the historic ones, but they make the book as a whole much better than it would be without them. It gives you a more complete picture of Eric as a human being: he isn't just this borderline-sociopathic hermit ignoring his millions while playing Metroid Prime; he was a person who loved computers from an early age, who never totally fit in, and who continued to amplify both of those traits more and more as he grew older. It also shows how the relationships of his youth led to his calculated courtship of Maya; he sets out "to hack the girlfriend problem" once he begins to notice girls, and while those early attempts end in miserable failure, he never loses his faith in the idea that relationships are a problem that can be solved: you just need to learn the right words, said in the right order, similar to an incantation spoken in the Tomb of Morbius, in order to "win" your prize. Hrm... looking over what I've written so far, I realize that I've failed to mention one critical point: this book is funny. Often funny in the discomfort-comedy vein, but it's also filled with wry exposition and clever phrasing. The protagonist is an ironist who sees his own irony and gestures towards it ironically until it becomes funny again. I'm not sure exactly how much time has passed since my last unwise attempt at social contact, but the number of days modulo three must equal two because I'm getting a burrito. I turned the fantasy over in my mind, adding details, refining the characterization. Every twist in the program's design, each new puzzle and contrivance, was tested against Bronwel Oberfell. Sometimes the dream would be interrupted by an error message, and I would get out of bed and look over the code. I caught a few bugs that way. I still haven't found anything that keeps anxiety at bay as reliably as coding: the possibilities and ramifications branch outward to colonize all of your available brainspace, and the syntax of the language gives direction to your twitches and impulses and keeps them from firing off into panic. For a while Hannah Provonost needed someone, and I made myself into the person that she needed, and while it wouldn't scale it was at least a proof of concept. Fantastic stuff. The author is clearly someone intimately familiar with not only the jargon of software development, but its meaning and ramifications as well. I'm not sure how salable a skill that is (there can't be that many people out there who really grok this stuff), but I for one am delighted to read it. The book ended up not being quite what I expected, but it was still pretty remarkable. I get the feeling that I'm one of the few people who will resonate with this story in quite the way I did, but who knows, maybe that's my own megalomania speaking. It certainly doesn't require an intimate understanding of a programmer's mind, and hey, maybe it will even help other people fathom our weird way of perceiving the world. Anyways: apart from the subject matter, it's a darkly humorous look at a very flawed man stumbling into adulthood, and succeeds in telling a story that covers a familiar plot arc in a very unique way. I had a nice big post half-written about GTA:Online, only to have Blogger decide to swallow the whole thing and make it disappear. That bummed me out, but the more I thought about it, the more I realized that this was a perfect metaphor for my entire experience with this game. I put a lot of effort into it, my progress vanishes, and I'm left feeling profoundly skeptical of the supposed virtue of cloud computing. So, yeah.... to briefly recap what I was spending way too many words on before, GTA:O is a very ambitious game with a lot of potential, but is profoundly frustrating to play. Now that the most glaring technical glitches have mostly been removed, it's easier to see that the underlying gameplay hasn't been thought through very well. It's a lot of fun to mess around in the open world with other friends, but all of the incentives built into the game discourage you from doing exactly that, and so most people either end up doing nothing but races or killing other players. The Comedy Bang! Bang! live tour premium podcasts are totally worth buying if you enjoy that show and/or Paul F Tompkins. It's $25 for the whole set, which sounds like a lot, but gets you well over 20 hours' worth of fantastic comedy. I enjoy the regular podcast, and the weakest shows on the tour are as good as the best standard shows. A huge part of that is due to PFT's presence and his terrific chemistry with Hot Saucerman. It's really fun to see the little running jokes for themselves that they inserted into the shows; even though Paul plays a very different character every night, there are these little threads of consistency that tie things together. Pretty much all of PFT's characters appear at one time or another, most of them showing up twice throughout the tour. It was fun to hear some of them that I haven't heard from in a while, like Ice T and John C. Reilly, as well as perennial favorites like Werner Herzog and Andrew Lloyd Webber. He also includes some of his newest creations like Richard Harrow's Ghost (quickly becoming one of my favorite characters) and Alan Thicke (who has much more staying power than I initially thought). I think the only one to not make an entrance was Mr. Brainwash, which is fine - Mr. B is fun in small doses on the Pod F Tompkast, but it's hard to imagine him holding up an entire episode. Anyways. The whole set is worth grabbing, but if you want a couple, my favorites were probably the Toronto show (which had the best opening guest), Philadelphia (a shocking encounter between ALW and Tom Leykis), both Boston shows (JCR in one, WH in the other), Chicago (another great JCR appearance), and Seattle (Richard Harrow's Ghost). It's all good, though. Other news: On Halloween this year, I watched The Descent, one of the rare horror movies to have caught my attention. I've deliberately eschewed all spoilers for the past seven years, and so was happily unprepared for everything that went on in there. It was excellent, one of the best movies I've seen from a genre I dislike. It was back on my radar partly because Neil Marshall, who directed both that movie and the Blackwater episode of Game of Thrones (possibly the best-directed television episode ever), will be returning to direct the ninth episode of the upcoming season. Having read the book, I have a pretty good hunch of what events that episode will cover, and can hardly wait to see it. I recently jumped back into the Neverwinter franchise, finally rolling my PC for the original campaign of NWN2. I spent way too long just coming up with the concept. There's an incredible amount of customization available, including choices like playing as a Tiefling, Drow, Sun Elf, Shield Dwarf, etc. The actual skills and feats seem very similar to those in NWN, which is good. I eventually decided to create a fighter, which I think is a first for me, from any of my experiences in Baldur's Gate, NWN, or Dragon Age. I'm Chaotic Good again, but playing a much more brash and outspoken type than usual - Toman will tell people to their face when he disagrees with them, unlike my standard characters who cloak everything in subterfuge. So, that's going on too, and probably will be for a while. One more game until Mask of the Betrayer arrives on the scene! Here’s the latest entry in my series of “Games I’ve played long after most other folks have finished, and long before they become retro”: BioShock Infinite! I have opinions! Often-contradictory ones! First, a bit of background on my existing prejudices: System Shock 2 (created by another, now-defunct studio that employed many of the creators behind the BioShock franchise) is one of my favorite games of all time. I still think that its villain is the best video-game villain to date. While the game is somewhat dated technologically, it still feels state-of-the-art in many ways, most notably its incredible sound design. So, I looked forward to BioShock Infinite with a mixture of excitement and caution. It looked gorgeous, and after the somewhat-repetitive BioShock 2 I’ve been anticipating the fresh territory they can mine with a total change in setting. I was hopeful, but not particularly optimistic, that they would also improve their in-game storytelling, allowing player actions to have the same importance and gravity that they allow their fixed fiction. As I’ve been mulling over this blog post, most of the things I’ve wanted to write about have been critical of the game, so I’m a bit worried that it will leave the wrong impression. Therefore, I’ll state up front that BioShock Infinite is a great game. It’s possibly the most gorgeous game I’ve ever seen, with stunningly lush environments (a welcome change from the dourness of Rapture! ), phenomenal character modeling, and wonderfully lifelike animations. Gameplay, while still primarily a FPS action game with some RPG elements, has some really fun and unique innovations, most notably a companion who you don’t need to babysit, and who instead aids you when you’re in trouble. I’ll get at the story below in spoilerville, but up top I’ll say that I enjoyed it much more than the story of BioShock, but still felt a lot of frustration at certain aspects of it. All of these games have drawn somewhat from the survival horror genre, but have moved gradually further from it with each iteration. System Shock 2 (I haven’t played the original) was the most brutal, with very limited ammunition and other resources and a seemingly endless supply of ravening, horrifying creatures trying to murder you. BioShock got more generous with your resources, and made enemy designs less macabre and more grim. Both games made very effective use of creepy sound design, and were perhaps a little too reliant on a trope of “Let’s lure you into a creepy-looking room with flickering lights…. oh no, the lights went out! You hear a door slam shut! SOMETHING IS SKITTERING AROUND YOU!!! You can move around but can’t see anything. OH NO THE LIGHTS ARE BACK ON AND SOMETHING HORRIFYING IS HERE!! !” Thankfully, BioShock Infinite doesn’t return to that specific well, and instead finds other ways to inject creeping dread. Still, the baseline experience of Columbia is worlds apart from the confined spaces of System Shock 2 or Rapture: you’re often in the wide-open world, under a stunning blue sky with fluffy white clouds, not cowering in a slimy corridor trapped between flesh-devouring monsters. You walk through lush gardens, calming streams, a lazy beach, and all sorts of bright, cheerful, well-maintained civic institutions. This is getting at what’s probably my single favorite aspect of BioShock Infinite: how original and creative it feels. That’s no small accomplishment! It sometimes feels like video game developers have an incredibly stunted vocabulary to draw from when deciding on their game concepts: “A gritty World War II battle… a sleek vision of the future with humans fighting aliens… a muddy medieval fantasy…” I can’t think of another game that has mined the territory BioShock Infinite has chosen for its inspiration: 1910s Americana, complete with bandstands, barber-shop quartets, long stripey bathing suits for men, cotton candy, revivalist tent meetings. This is married with another counter-temporal innovation akin to BioShock’s 1940’s undersea technology: lighter-than-air technology, which lifts the whole kit and kaboodle way up in the air, floating these grand edifices up in the clouds. They’re loosely joined together by a varied system of technologies, including sky-lines (essentially motorized bi-directional ziplines), zeppelins, floating yachts, and tethered barges. Again: lots of games let you fly, or lift you into the air, but I haven’t encountered another game that has come up with these fanciful means of transport, and that alone is a delightful reason for this game to exist. The game also deals with some interesting, weighty weighty themes. The *Shock games may be a great deal more subversive than we generally think of, since they offer pointed critiques of bedrock values in modern American society. System Shock was less overtly thematic, but did offer a chilling counterpoint to our society’s love of helpful electronics. Few Americans describe themselves as Objectivists, but the Tea Party’s ascendency was in some ways predicted by BioShock’s indomitable Andrew Ryan, and the game broadly examines not only libertarianism, but the free-market economy and capitalism itself, finding plenty to criticize. 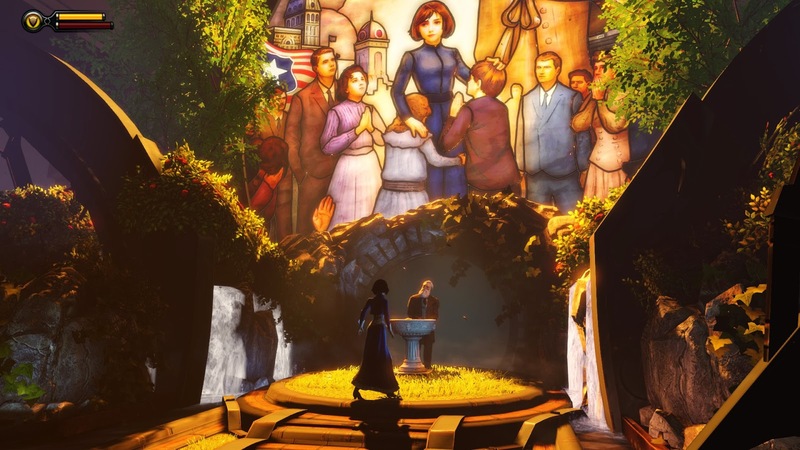 BioShock Infinite takes on an entirely separate, and probably even more potent, set of American values: Religion, faith, and independence. It also deals in a very direct and often uncomfortable way with America’s troubled history with race. The game is set long after the Civil War, but long before the March on Washington, and features white Anglo-Saxons proudly congratulating themselves at being so forward-thinking as to employ the “lesser races” as servants. You’re confronted with caricatures of African-Americans, Chinese, and Native Americans, with exaggerated features and stereotypical actions. You also get to meet the real people, who are often cowed and beaten down by their smug oppressors. As the game goes on, you’re gradually introduced to the finer grains of racism, including antipathy towards the Irish and Germans. All of this is very historically accurate, which just makes it more awkward. So, let’s get down to choice, shall we? There’s not a lot of it, which was frustrating at the time but, in retrospect, may have been a good thing. At the least, I’d rather that the game tell a constrained story that I merely play through, rather than offer bland dichotomies like those in its prequels. When you first enter Columbia, it looks absolutely incredible, like a vision of heaven. This early part actually may have been my favorite part of the entire game: you get to wander around amazing environments, listen to some beautiful singing, gaze in awe at your surroundings, eavesdrop on the sometimes-delightful period conversation. This made me wish that I was playing a different game than I actually was playing: I wanted to play an RPG, where Columbia could just be a city, a place I could spend time exploring and solving puzzles inside of. The stories also have some surface similarities. Instead of Andrew Ryan, the prophet of unfettered free-market libertarianism, we have John Comstock, a prophet who offers to cleanse away sins and build a better society on Earth. Both visionaries have created these incredible worlds, far more interesting than the mundane land-bound cities of America. In BioShock, you’re visiting his land after it’s all gone to heck. In Infinite, you’re seemingly entering Columbia in its period of greatest strength, even during its ascendency; your actions carry the threat of toppling it down. Interestingly, both men also have industrialists who serve as foils. Frank Fontaine featured prominently in the first game, and Jeremiah Fink plays an important role in the latest. Ryan and Fontaine were united in activity but divided in outlook: both ran businesses to make money, but Ryan was an idealist who wanted to change the world while Fontaine was an opportunist who wanted the best for himself. Comstock and Fink are divided in activity but simpatico in outlook: Comstock tries to focus on the spiritual and emotional in his role as prophet, while Fink focuses on efficient production and canny marketing in his role as profit-maker. But, Columbia is inextricably the product of both men: Fink manufactures all the machines necessary to elevate it and keep it running, while Comstock manufactures the fierce passions that draw so many men and women there and unite them in a common purpose. Comstock’s greatest opponent, though, is not Fink, but rather Daisy Fitzroy, an escaped former slave who has started leading a revolution of Columbia’s underclasses against their Anglo-Saxon “Founder” overlords. More on that below in mega-spoilerville. Computer technology has advanced a ton in the six years since BioShock came out, and that’s probably most obvious in the character modeling and animations. The previous games in the series have almost completely eschewed other on-screen humans: most of the time you’re fighting monsters, who don’t need to look particularly realistic. When they do add a human element, it’s been done not through the typical game mechanism of interaction, but rather through voyeurism: audio logs, phonographs, voxophones, that let you eavesdrop on the thoughts and actions that others have taken prior to your arrival. That’s let them make very fleshed-out characters without needing any actual flesh, as it were. Well, they’re now confident enough to have major characters on screen for a long time; in the case of Elizabeth, she’s practically always visible. They did a fantastic job developing her: her facial animations, gestures, movement, and speech are all incredibly well-done. At the same time, I think they made a very wise decision in making her slightly cartoony. It’s not a huge exaggeration, but big enough to move her out of the uncanny valley and into the world of video-game character. I think they get the best of both worlds: I can exclaim at how life-like her movements seem, without getting caught up on how much of her still fails to approximate life. That said, her story does not make a lot of sense to me. We’re expected to believe that she grew up in a totally isolated tower, with absolutely no human contact until she turned nineteen; and yet, she has incredibly high verbal skills, is able to pick up on all kinds of nuances of speech, and otherwise… just does not make a lot of sense. As you learn more about her history and purpose, there’s sort of an explanation, but the explanation kind of boils down to “She’s magical! Because quantum theory!” Anyways… realism is not something I demand from my entertainment, so it shouldn’t bother me much, but given all the effort they put into developing her character I would have liked a SLIGHTLY more believable backstory. So, while the regular people are delightful, they’re awkwardly spliced into a game that can’t really accommodate them. 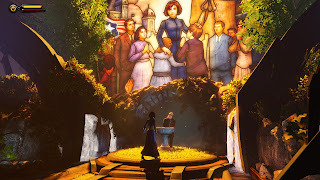 To its credit, BioShock Infinite tries to enhance its inherited systems to incorporate a living world; to its detriment, it fails in its attempts. In an early sequence, an on-screen warning alerts you when you encounter civilians while in a fighting stage, warning that it might make things more difficult if you kill them. This had the effect of making me hesitate before shooting anyone I came across for the rest of the game, since I hate killing innocents in any game; but it didn’t matter, since 99.99% of all encounters end with the other person shooting at you. I don't think there was a single incident after that first one where you could accidentally shoot a civilian, and not a single time when you could avoid a fight with an enemy soldier. Since Columbia is still a functioning society, you can encounter stores and dwellings that are still occupied, whose inhabitants will frown on you looting their goods. The game helpfully will show the message "Steal" when you hover over one of these items, and display in red text instead of white, which warns you about what you're going to do. This in itself actually leads to a nice mini-choice: you can steal, which will give you more resources but also cause consequences (NPCs turning violent, or calling for help, or just running away and making you feel bad); or you can ignore it and continue pretending you're in an RPG. However, there are also some times when an item ISN'T marked as owned, and yet taking it will turn everyone on the map hostile against you. This is particularly annoying when you try to Possess a vending machine, which is something the entire rest of the game has hard-wired me to do reflexively. In multiple cases, I ended up reloading a level (sometimes losing some good progress) just because I hadn't meant to trigger this reaction. Anyways, it's annoying to have what feels like a half-baked ownership system grafted onto a game that's fundamentally about grabbing every single thing you can see. Speaking of grabbing: The BioShock games are some of the most Skinner-ian experiences I've ever had. The world is filled with containers, and the containers have good things inside (money, ammo, health, salts), so you spend much of the game just mindlessly pressing F-F-F-F-F-F-F-F-F-F. BUT, the game lets you consume food even when your health is at maximum, so you sometimes end up wasting a resource that you could have better saved until after an upcoming fight. Annoyingly, this is only true of health; the game keeps you from picking up salts or ammo if you're at the maximum. And rarely-but-not-too-rarely the game will drop in a rotten piece of food which actually decreases your health. This is marked, so you can just not press F a second time to avoid eating it; but, that slows down the process of spamming the F key whenever you open up a new room; more annoyingly, if that rotten food shares a container with something you want, like Silver Eagles, then (as far as I can tell) there's no way to take the money you want without also eating the rotten food you don't. Late in the game, you can get allies to fight alongside you, which is awesome; however, it's very easy to shoot them. It would be nice if there was a stronger visual distinction between factions, instead of just a pop-up that says "Don't shoot your allies!" after you've already shot your allies. Fundamentally, though, the problem is that the first 80% of the game has trained us to shoot everything that moves, and it's very hard to break that habit this late in the game. There's a section of the game after you acquire the Shock Jockey vigor, which has a combat purpose but also lets you re-activate certain electrical generators, which lets you solve puzzles and acquire new items. So, I kept an eye open for those generators for the rest of the game. And, of course, they completely disappear soon after you see them. Once again, the game has trained me to do something, and then totally ignores it for the entire rest of the game, causing me to waste time for no good outcome. One of my biggest annoyances with the story was a sense of false equivalency. The Daisy Fitzroy situation initially bugged me since I assumed that it would be another thing like the Little Sister situation in BioShock: there would be a Big Choice to either support Fitzroy or Comstock, which would determine the outcome of the game. And that bothered me since I didn’t think it would be an interesting choice: Daisy had genuine grievances, and was fighting on behalf of an oppressed minority against an oppressive majority. Why on earth would I side with Comstock? Well, it turned out I didn’t have to. The plot plays out in a predefined way, with circumstances compelling you to ally with Daisy. I was a little miffed that “I” (as Booker DeWitt) was so resistant to helping her out: Booker just wants to do a job, while I wanted to ally with Daisy's greater cause. I wanted more enthusiasm from Booker, but was generally okay with the way the plot was going. Later in the game, though, the rebels start winning, and a bit after that they turn against you. I felt like the game was implying that there was no real difference between Vox Populi and the Founders. Now, I don't want to go overboard and idealize the Vox: they are certainly not perfect. But, I'm a bit stunned that the game would imply that rebelling slaves are as evil as the slavers. I wanted to see this as a tragic situation, of noble aims led astray, and been able to rein back in the Vox's worst impulses and refocus on universal values (freedom, safety) rather than vengeance. That was probably the single thing I most disliked about the game. It ends up not being that significant in the context of the whole game, though. I'm still not totally sure how I feel about the multiple-worlds thing: it was surprising, and cool, and is something that fits very well within the framework of a video game: I like the idea that when you re-play this game, you're not re-doing your earlier experience, but rather defining the events that took place in a parallel universe. But, I don't think that the underlying game itself justifies that. The plot is just too linear, too fixed, with too little opportunity for variations: the only interesting differences in the plot are the two destinies for Booker that are embedded within the structure of the game itself. I can't replay this game and create a version where Daisy lives, or where Fink is persuaded to turn against Comstock, or where the Luteces separate. The dialogue in the game talks about how there are some fixed points (it always starts with a lighthouse, etc.) and variations, but the content of the game consists almost entirely of fixed points. And, again, fixed points by themselves aren't necessarily bad. I would never claim that Portal is a bad game because it didn't feature alternate endings. But I think that the lofty and ambitious metaphysics presented by Bioshock Infinite can't begin to be justified by the gameplay they accompany. There are alternate universes, generated by quantum events. Each time a choice could go multiple ways, an alternate universe is created. Some things must stay constant, but many can vary. Booker DeWitt, a veteran of the Indian Wars, feels bad about what he's done in war. He encounters a revivalist preacher who offers to baptize him. In one reality, he accepts the baptism and is reborn as John Comstock, The Prophet, and starts having spiritual visions. In another reality, he remains DeWitt, and joins the Pinkertons as a detective/thug/enforcer. Comstock meets Rosalind Lutece, a brilliant physics theorist who understands the nature of the universe. They form an unlikely partnership: her inventions allow a city to fly, and he can give her the resources to pursue her own project of uniting with her "brother" Robert, a male version of herself who exists in other dimensions. One of Comstock's prophecies states that his daughter will fulfill his visions and rule both Columbia and the world. However, Comstock is impotent (perhaps from contact with the quantum devices). Rosalind agrees to help Comstock, over the objections of her brother: in this reality Comstock has no child, but in other realities, Booker does. Robert contacts the younger version of Booker. Tears in the quantum fabric of the multiverse let you traverse both dimensions and time; I think that Comstock is probably around 45 in his reality while Booker is around 25 in his own. Booker agrees to surrender his own child Anna in exchange for... I'm not sure what! Forgiveness for sins? Payment of monetary debts? In carrying out the deal, Robert and Rosalind are reunited. Booker changes his mind, but is unable to bring Anna back through the tear. The tear closes, lopping off her pinky finger. In the Comstock reality, Comstock renames Anna to Elizabeth and begins grooming her for rule. This means locking her up in a tower and denying any human contact. But, she has an endless supply of books, phonographs, movies to watch, etc. Elizabeth has special powers. I'm not sure if this is the result of her moving through the tear, or her existing in a reality other than the one into which she was born. In either case, she is able to find and open tears all on her own, without requiring the massive machinery of the Luteces. Comstock and his flunky scientists (probably not including the Luteces) tap into this power, lessening Elizabeth's abilities (so she can open tears but not create them) and possibly using the power to help fuel Columbia. Robert isn't happy about what's happened to Elizabeth. He convinces Rosalind to help undo their actions, even though it will mean their separation. They may or may not know that, in the future, with Comstock's plan set in motion, Elizabeth will use the might of Columbia to rain fire down on Earth, eventually conquering all the inhabitants. And, with her own powers, she won't just conquer one Earth, but all of them: she'll be able to open tears and move her vast army into all universes at will. So, the Luteces convince Booker to capture Elizabeth and bring her back to New York. At some point here, he moves into the Comstock/Columbia universe. Elizabeth is now nineteen, and Comstock an old man. Booker still mourns Anna, but has repressed the memories of his complicity in her loss. Comstock was present when the Luteces took Elizabeth, so he knows what Booker looks like. He knows about the mark on Booker's hand, "AD" for "Anna DeWitt". Comstock has passed this description along to his peoples, warning them of the "False Shepherd" who has come to take "The Child" Elizabeth. Booker rescues Elizabeth from the tower. She wants to go to Paris. Booker lies and says that he'll take her there. They try to escape Columbia, but whenever they acquire an airship capable of leaving, they're attacked by Songbird, an enormous avian automaton designed to protect Elizabeth. They get separated multiple times and reunited. She eventually figures out that he was hired to kidnap her and is justifiably angry. But, he keeps protecting her, and she decides that leaving with him is better than getting locked back up in the tower. Daisy Fitzroy, leader of the Vox Populi, agrees to help them escape if they'll help her acquire weapons for her army. Booker and Elizabeth initially fail, but then start traveling between alternate universes until they find one where the Vox have gotten their weapons and are winning the war against the Founders. But, in this universe, Booker allied with the Vox (why can't I play in this reality?!) and died a martyr to the cause (oh.). Daisy is understandably nonplussed when Booker shows up again, figuring him for an imposter, or at the very least an inconvenience in this great narrative she has going on. She orders the Vox to destroy him. Daisy kills Fink, who has been manufacturing almost all of Comstock's supplies. In a frankly unbelievable turn for her character, she threatens to kill Fink's young son. Elizabeth stabs Daisy from behind, through the stomach, with a pair of scissors. It's pretty shocking. Elizabeth starts getting really upset about what she's done, while Booker tries to persuade her that both of their actions have been justified. Elizabeth asks Booker to kill her if it seems like she'll ever be returned to the tower. Songbird ambushes them as they're about to escape. Before Songbird can kill Booker, Elizabeth offers herself up freely to return. He takes her away. I think there's another shift between realities here. Rather than the tower, she's taken to a new institution where she's tortured and gradually gives in to her destiny. In this reality, she succeeds Comstock after his death, then militarizes Columbia and launches an aerial attack on New York City. Part of her knows that this is wrong, so she sends Booker back in time with enciphered warnings to her younger self explaining what she'll need to do. Back in the past, Booker rescues Elizabeth again, and destroys the tower. Since the tower had been siphoning off her power, Elizabeth is now, for the first time, in full control of her abilities. She can open tears anywhere, to any time or place. She also seems to suddenly understand the nature of the multiverse and everything that has happened; I'm not sure if this is also a result of the tower's destruction, or if it's from the code sent back by her future alternate self. Elizabeth walks Booker through his history, showing him the real history of everything that had happened. He finally understands that Elizabeth is his daughter, and that he is Comstock. Oh, yeah, Booker killed Comstock. I forgot to mention that. Elizabeth was going to, but Booker beat her to it. Comstock was going to reveal that Booker gave up Anna/Elizabeth; once she figures it out, she shows these events to Booker. Booker and Elizabeth both understand that they can't make things better by just killing Comstock: as long as some version of Comstock exists in some other universe, he'll just continue his plan and conquer all universes. The only way to win is to go back in time before Comstock was born and "smother him at birth". Booker figures that this means smothering him as a baby. Comstock wasn't born, though: Comstock was born-again, baptized in the river into his new faith. So, Elizabeth and her alternate-dimension Elizabeths hold Booker down under the water and drown him. He dies. The end. On the one hand, it was an unexpected and cool ending. Almost no games end in this way, with the protagonist dying, and I actually really like it: it's melancholy with just a little bit of uplift, since your sacrifice (unwilling, in this case!) makes the world a better place. On the other hand, it makes less and less sense the more I think about it. Elizabeth is drowning you, the future version of Booker, not the younger version. Killing someone when they're 38 years old won't kill the version of them when they're 18 years old, right? And I don't think that having two versions of the same person in the same reality will somehow erase the younger version, either: after all, we've just played an entire game where Booker and Comstock have coexisted in space and time. The alternate Elizabeths all gradually disappear after you drown, which is sad and makes sense - if Booker died before Anna was both, there can be no Elizabeth. Anyways! Like so much else in the game, this felt really ambitious and really interesting, which makes the flaws all the more frustrating. Favorite weapon: I relied on the Machine Gun and Carbine for most of the game. I didn't even try many of the later weapons, though. Favorite NPC besides Elizabeth: Daisy Fitzroy, with Rosalind Lutece a close second. Favorite combat tear: Summoning a mosquito. Favorite infusion: I maxed out Armor before I spent a single one on Health. Salts are useful, though I never ran out after getting about 5 upgrades. Favorite setting: Anywhere outdoors in Columbia is pretty great. I might give the edge to Battleship Bay. Creepiest setting: Oh, definitely the workshop with all the decapitated toy heads of Benjamin Franklin. Phenomenally unsettling atmosphere in there. Favorite combat move: Sky-hook executions looked cool, but I rarely did them. It's simple, but I loved chaining enemies with Shock Jockey, then stunning the crowd each time I burned another one down. Favorite hat: I ended the game with Rising Bloodlust (increase weapon damage with each kill), but prior to that had used Storm (chain effects when killing with certain vigors) or Sheltered Life (brief invulnerability after eating food). Favorite shirt: I ended with Scavenger's Vest (enemies give ammo 40% of the time). For most of the game I used Blood to Salt (enemies give salt 40% of the time). Favorite pants: Urgent Care (shield regenerates sooner and more quickly). I was very shield-reliant in my game. Favorite boots: Overkill (killing an enemy with excessive force will stun nearby enemies). Biggest complains about gear: Far too many items require skylines, which are only present in a few fights, or melee, which is usually an awful idea. Favorite statue: So many to choose from! The Child is pretty awe-inspiring. But the Founding Father statues are so startling that I might need to pick those. Weirdest enemy: Mecha-Lincoln has come to destroy you!!! Toughest enemy: For me, it's The Mechanic. Not so much for the skyline-electrocution thing (I rarely use those anyways, even during combat), as the way he'll rapidly close in on you and won't let up. Coolest boss fight: The ones with the ghost of Lady Comstock were really frenetic and fun. The long fight near the end where you had to defend the airship against zepelins was surprisingly fun too. Favorite voxophone: Alternate-world Booker describing his decision to join the Vox. Favorite filmstrip: The alternate-universe ones with older Elizabeth are chilling and neat. Most stunning alternate world: Elizabeth raining hellfire down on New York City is awe-inspiring. So, would I recommend this game? Yeah, I guess. The gameplay is fine, the story is cool-if-frustrating. The graphics, modeling, and animation are the real stars of the show, arguably the best of any game created yet. The world looks amazing and cool, and you'll wish you could spend more time exploring it instead of just shooting people in it. Oh: Very late in the game, I took a handful of screenshots. (I feel way less compelled to do so in games with minimal options for character customization or branching plot choices.) These are all from the finale of the game and super-spoilery. There's an expansion thingy coming out in the next month or so, which I'll be keeping an eye open for. It sounds like there will be two parts to this, and I'm not sure whether I'll get the "season pass" now to buy both cheaper, or wait until both are out and check the reviews for their quality. From what I've heard they'll be improving and adding new game mechanics like stealth, which could go a long ways to helping this series reach its potential.